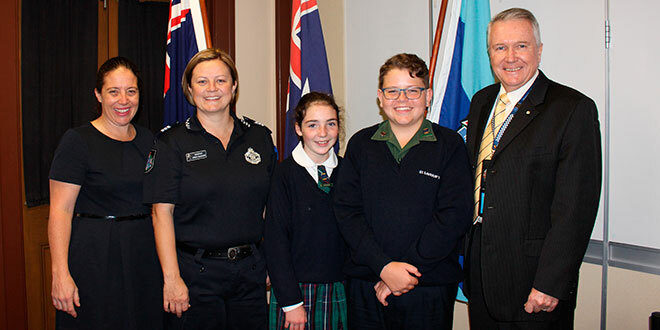 Police support: St Saviour’s principal Donna Muir, Adopt a Cop Sergeant Kirsty Gleeson, school captains Georgia Muir and Christian Peterson, and Deputy Commissioner Tony Wright in Toowoomba. ST Saviour’s Primary School reached out in support of colleagues of slain Toowoomba police officer Senior Constable Brett Forte. School principal Donna Muir, administration assistant Julie Robinson and school captains delivered two car loads of home-baked goods to Toowoomba Police Station recently to provide moral support after Snr Const Forte had been killed in the line of duty. Snr Const Forte was working with Toowoomba’s Tactical Crime Squad. Police had stopped the offender in the Lockyer Valley when he opened fire, and shot and killed Snr Const Forte. St Saviour’s students had made cards which included a prayer to the patron of police St Michael the Archangel. The cards were presented when the school representatives visited the police station. “Our families baked plates of slices, cakes and cookies for the police officers who worked with Brett Forte,” Ms Muir said. “We were so blessed to have the Deputy Commissioner attend and he presented us with remembrance police badges. “It was a bit overwhelming actually when we were supposed to be serving them. “It was a very moving morning seeing these great people and the hard times they are experiencing at the moment.